Super Eagles coach Stephen Keshi has revealed his 2014 World Cup target is to surpass the country’s best performance of reaching the Round of 16. Nigeria reached the Round of 16 at USA 1994 and France 1998, but have since failed to go beyond the group stage in Korea-Japan 2002 and South Africa 2010. Top Nigeria officials have said they will not set a World Cup target for the team in Brazil so as not to put them under undue pressure. But Keshi has now said he hopes to lead Nigeria to improve on these records by at least reaching the quarterfinal, which is also the best performance by an African team and has been achieved by Cameroon (1990), Senegal (2002) and Ghana (2010). Super Eagles coach Stephen Keshi. 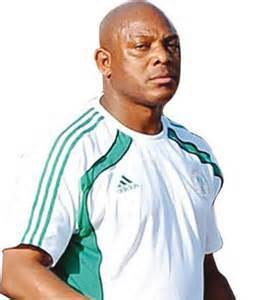 “I am looking out to get a very good squad for the World Cup and go beyond Nigeria’s record in the previous World Cups,” Keshi told Brila FM on Monday. Nigeria are drawn in Group F along with Argentina, Bosnia-Herzogovina and Iran. Keshi has proposed a pre-World Cup training camp in the United States of America from May 25. African champions Nigeria have also picked a training base in Sao Paolo and are due to play a friendly on March 5 in Europe as part of the build-up to Brazil 2014. The ‘Inspiring Man:’ The Man Trying to Dribble Football Across Eleven Countries to Brazil Died After Being Hit By a Truck. Vidic’s United Exit By Mutual Consent, Says Moyes. Previous articleBasketball: Warlord, Hope 4 Girls, Emerge Victorious in the 2013 Police Rookies Championship.